Fine artist Gail C. Gray has lived and worked in Lancaster Pennsylvania since 1972, maintaining a downtown studio since 1991. Gray earned a Bachelor of Fine Arts degree with a dual major in Painting and Design from Carnegie Mellon University. 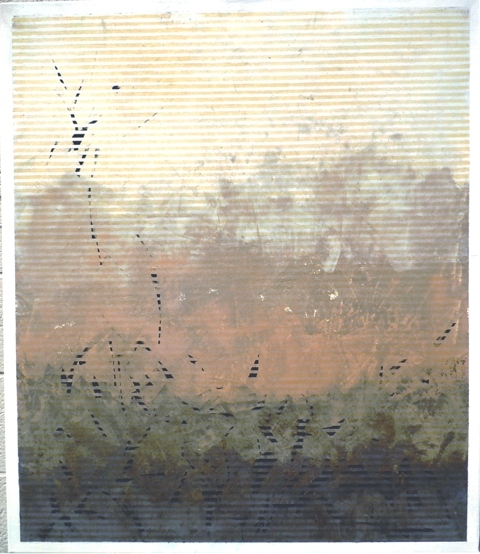 Gray continued her studies at Carnegie Mellon in graduate printmaking under the direction of Professor Robert Gardener. Gray has exhibited in juried and invitational art events nationally, regionally and locally. Working in many media including painting, printmaking, fabric and fiber art, collage, assemblage and site specific installations, most notably in the Carnegie Museum of Art in an Associated Artists of Pittsburgh exhibit juried by renowned Dutch architect Aldo Van Eyck in 1969. Most recently, Gray received an honorary Doctor of Arts degree from Franklin and Marshall College in May of 2016. Gray's works are featured in various Lancaster downtown public spaces including Saint James Episcopal Church, Marriott Hotel and Convention Center at Penn Square, The Lancaster Bar Association, Lancaster County Courthouse, Mid-Penn Legal Services, the Lancaster Museum of Art's permanent collection, in private collections, and also business venues. Science has been the major motivator of Gray's works which currently are inspired by evolutionary and linguistic studies. The latest works concentrate on abstract images representing the successive steps of genetic inheritance with its modifications and mutations over time. Conventional thinking about the history of science had assumed that scientific knowledge proceeds incrementally, as an ongoing accumulation of facts and theories, moving ever closer to an ultimate truth. A classic illustration of this, is that of a paradigm shift, wherein a universal view posited as geocentric was replaced by a heliocentric or sun-centered model. Copernicus first proclaimed this scientific reality, but it was Galileo who reintroduced it - to the extreme and uncompromising displeasure of Orthodox Christianity. The implications were momentous, and eventually fatal to the view of the old order. Art history follows much the same pattern as shown by radical breaks with tradition, novel developments spurred by science, or socio-political movements. There are disjunctions, and turns taken which are unpredictable and revolutionary. These are the kinds of influences propelling most of my creative work. How do I as artist express these complex concepts? They are abstract ideas expressed abstractly, yet to be intelligibly grasped, they must be rooted in some concrete physical reality. The forms, materials and approaches I choose issue from my immersion in scientific, historical and philosophical literature. The colors, patterns, shapes, textures and layering I employ emerge in response to these studies. They are forms abstracted from concrete or theoretical ideas - constructions that speak a language that words cannot. y exploration continues, in a radial way, as spokes attached to a hub radiating in many directions from a central idea. I ask that you confront my work in a spirit of looking for thematic connections, not just looking for visually similar motifs. This is my way of communicating disjunction, effacements of forms, as one structure is slowly overtaken or abruptly replaced by another. In this way, you become a participant in these works. A friend recently described me as " an artist on the frontiers of science". I adopted the description immediately.